Spain TEFL Crash Course FAQ: how to become certified in Spain? HomeAll postsGeneralWhat makes speaking difficult for EFL learners? 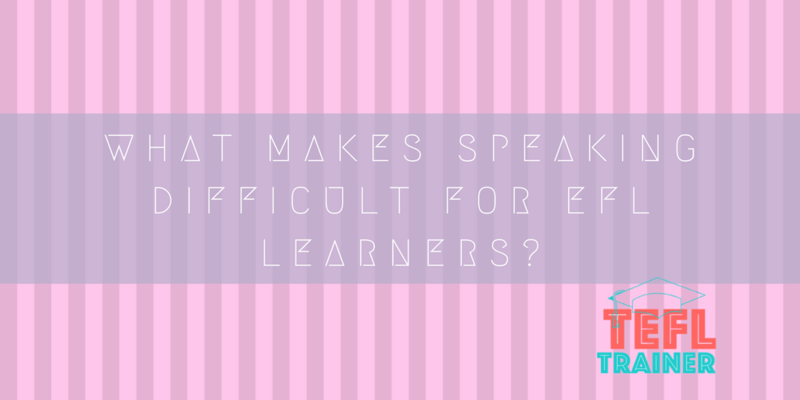 What makes speaking difficult for EFL learners? What are the typical components that should be considered while teaching speaking? Speaking is one of the four language skills that are found at the core of every English teaching practice. One of the first things students are eager to develop, in order to use the language, is communicative competence. This requires a complex interactive skill, in other words: speaking. There are several components that should be focused on when it comes to teaching this particular skill. In this journal we are going to discuss linguistic features of speaking and how to approach the difficulties that arise during speech production. Before developing their conversational skills and managing rapid communication, EFL learners need to acquire the knowledge of grammar and vocabulary. Likewise, pronunciation is one of the basic linguistic features that is practised in EFL classrooms and at the same time the cause of the most prominent issues. On one hand, drilling students with pronunciation exercises and forcing them to repeat the same word over and over again can be tedious. On the other hand, your students will be grateful since it will help them to avoid fossilization. Another relevant point that teachers should consider is the distinction between accuracy and fluency. Throughout the history of language acquisition and instruction, the emphasis has been put on accuracy, meaning the use of correct grammar. Additionally, it is still important to motivate your students to use the proper grammatical structures and utterances. But the focus should be put on producing meaningful phrases. When it comes to my experience with teaching speaking, learners must manage to combine accuracy and fluency in order to speak spontaneously and negotiate meanings. Moreover, as teachers we should pay attention to language ego that is related to anxiety and fear of speaking. There is a great number of students who lack the confidence to express themselves because they are afraid of making mistakes. This is one of the greatest challenges in my classroom as well. In order to reduce this anxiety, I am trying to create a warm and supportive environment in which students can feel comfortable to speak despite their mistakes. In fact, I always tell my students they should not be embarrassed of their mistakes because errors are part of every learning process. Other difficulties I have experienced during my classes were related with reduced forms and colloquial speech. For instance, students were unable to understand my questions if I used contracted forms, elisions or reduced vowels. It is necessary to familiarise EFL learners with these forms as they are part of everyday speech and they will certainly encounter them in real conversational situations. Secondly, I gradually include parts of colloquial language such as idioms, different expressions and phrases. This provides them with guided input that focuses on specific type of discourse that will be useful outside of the classroom. 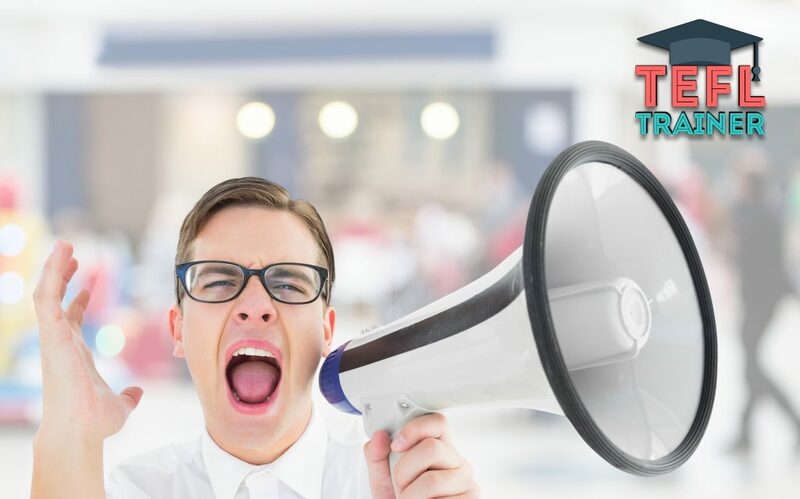 Teaching speaking is a demanding task that requires patience and a lot of practice. Our task as teachers is to inform students about the targeted features of speech they need to develop further, as well as guide them through speaking tasks, encouraging them to freely express their thoughts. Finally, we should not forget sensitive nature of each individual and be careful when it comes to feedback and error-correction. Brown, H. D. (2001). Teaching by Principles: An Interactive Approach to Language Pedagogy. 2nd edition White Plains, NY: Longman. Burns, Anne; Siegel Joseph (eds.) (2018). International Perspectives on Teaching the Four Skills in ELT: Listening, Speaking, Reading, Writing. Palgrave Macmillan. Bygate, Martin. (1987). Language Teaching: Speaking. Oxford University Press. Why is using YouTube in the classroom beneficial for learners/teachers of EFL? What are the main constraints in the classroom facing TEFL teachers? When should fluency take some priority over accuracy? Teaching pronunciation and using repetition to help learning. How do you present yourself and your experience? How to teach students about academic writing? How beneficial is it for the students to have different teachers each lesson? How to utilise the online material?